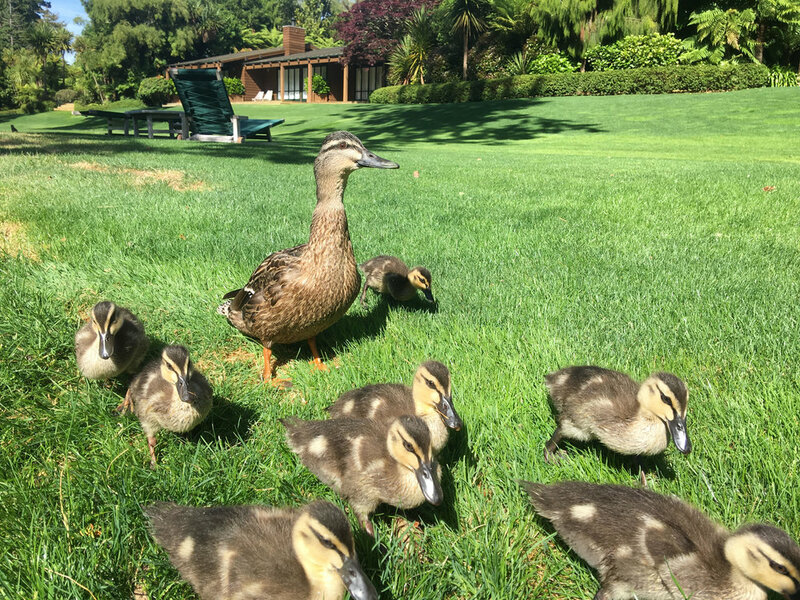 Consistently ranked as one of the top lodges in New Zealand, Huka Lodge is located in Taupo on the banks of the Waikato River centrally located to many of the North Island unique experiences. It lives up to its reputation as one of the world’s finest retreats, one of those special places where everything is somehow perfect. Super comfy cabin suites all overlook the water blending seamlessly with the peaceful and lush 17 acres. 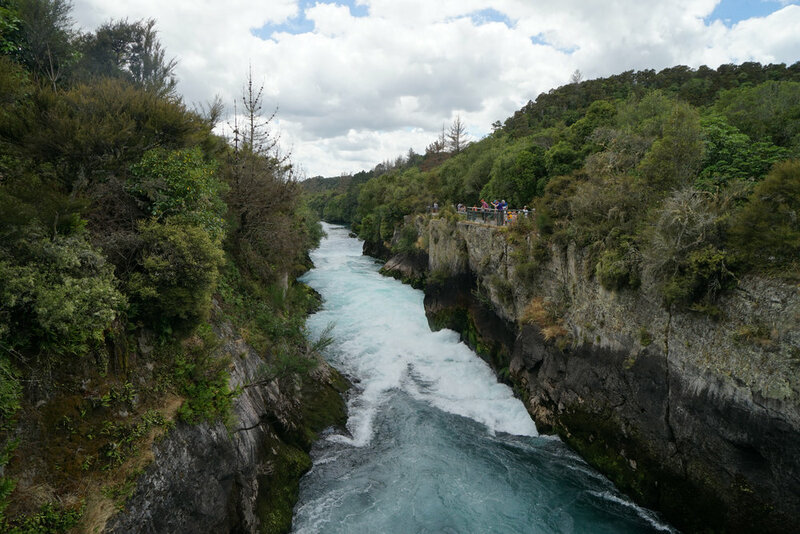 Nearby legendary trout fishing, the spectacular Huka Falls and the clear waters of Lake Taupo await. History: We arrived at Huka, and General Manager Kerry Molloy showed us around with a smile and an endless trove of silly jokes and one-liners that had us smiling the whole time. Renovated in 1984, Huka was built in the 1920’s by Irishman Alan Pye, an avid fly fisherman who fell in love with the area. And indeed Huka has gone on to attract renowned anglers including Queen Elizabeth, James Michener, and Charles Lindbergh. Cocktails: Come early evening, the cocktail table beckons and guests gather around the fire for canapés and cocktails. Sip a glass of local wine or a delicious red from the owner’s South African vineyard as your waiter describes the menu of the day. Dinner: Dining venues are spread throughout the property, many private, romantic and unique. Some guests dine in the library, others in the wine cellar or garden, but nothing can top dinner at the jetty –we ate in a private gazebo alongside the rolling river, a fantastic evening we won't soon forget. Request this spot when you make your reservation. Fish: The world-renowned Tongariro River (a 25-minute drive from Huka) is considered one of the best fishing rivers in the world and is New Zealand’s most popular fishing location. Full day guided fishing, helicopter transfers and lunches can all be arranged through the hotel. The Ultimate Hike: If you have the time, then NZ has the hike for you—the Tongariro Alpine Crossing, considered to be the best one-day hike in the country. The 7-9 hour hike in the Tongariro World Heritage Park passes past some of the most volcanically active and scenic spots in the region. Huka combines well with a stay before or after in Hawkes Bay. We left Cape Kidnappers after breakfast and arrived well in time for lunch stopping for a quick tour of Napier and its art deco buildings. The drive is approximately two hours door to door. Meals are included with your stay at Huka Lodge, and though excellent they are a lavish, formal affair. After a week traveling, the second night of our stay we needed a break from a rich gourmet meal. The chef was happy to make us Pasta Pomodoro and a plain grilled steak. Judging from some of the plates coming out of the kitchen we weren’t the only ones with the idea. New Zealand has a temperate climate with moderately high rainfall and plenty of sunshine. The ideal time to visit New Zealand is between November–March with January and February being the warmest months. Remember our summer is their winter. July is the coldest month of the year with temperatures averaging around 50-60°F. Want to stay in Rotorua? Check into the Solitaire Lodge, a luxurious, nine-room property set on a private peninsula on the shores of Lake Tarawera. Along with beautiful views, the lodge also has thermal baths, and you can swim and fish right in the lake. Cruising: Lake Taupo is big, the equivalent landmass of Singapore, a total of 616-square kilometers. We enjoyed a scenic lake cruise out to the Maori Rock carvings, a light lunch with a little fishing, ending with an hour or so hike along the lake. On a clear day views of Mts. Ruapehu, Ngauruhoe and Tongariro volcanoes can be seen at the southern end of the lake. Geothermal Wonders: If you haven’t been to Iceland’s sulfurous wonders, Craters of the Moon is a place you must visit. Boardwalks and pathways lead you through this active geothermal terrain, a desolate moonscape with clouds of swirling steam. An afternoon here is a science class brought to life. Want more? It’s just one hour to Rotorua—famous for its geysers in multicolored geothermal parks. Warning: The smell is reminiscent of rotten eggs! Volcanic Safari: We hope your not afraid of helicopters because NZ’s most incredible experiences usually involve the whirlybird. Depart right from Huka’s lawn en route to White Island and Mount Tarawera with the thrill of combining landings on both. (Weather permitting) Along the way have your camera handy for spectacular aerial views of Wai-O-Tapu Thermal- New Zealand's most colorful volcanic area. The climax of the journey is standing on and walking around White Island’s active crater floor; for sure one of the highlights of your trip. 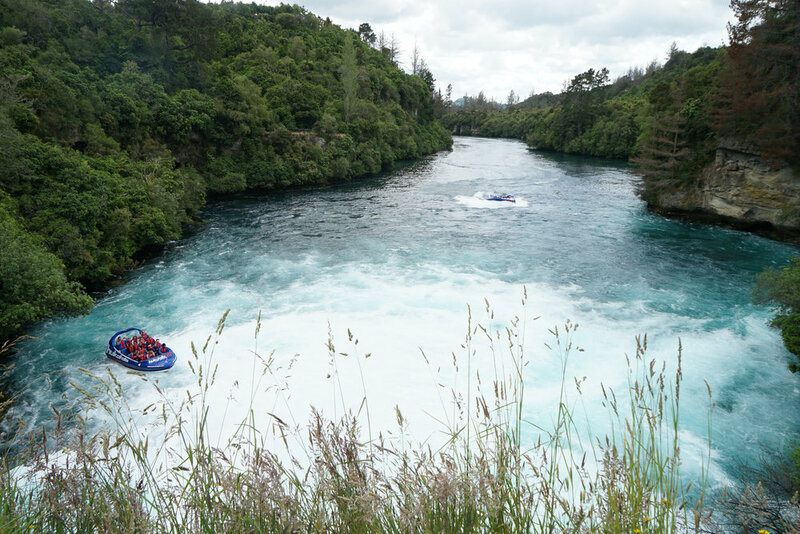 Other Activities: Adrenaline junkies take a ride on the Huka Falls Jet boat, go on a quad adventure, or head out white water rafting. Enjoy a leisurely kayak down the Waikato River or on Lake Taupo, where you can paddle out to see the Maori Rock carvings. (It’s a long trip by kayak to see them, approximately 4 hours round trip.) On the edge of the Craters of the Moon thermal wonderland lies some of the best mountain biking in the region. Saddle up and horseback ride across a range of landscapes at Poronui. For something less active; visit Lava Glass, a glass blowing studio where you can see the artisans at work, and meander around their sculpture garden with over 500 items. Don’t Miss: Combining a picnic lunch with one of your activities. The lodge packs an elegant hamper—you want to do this!